UPDATE ALERT! Check out this week’s Latest Buzz blog post where we cover Part 2 of the New Member Signup Widget upgrade! Membee updated the New Member widget on Sunday, June 25, 2017. We updated features that were already in place and also implemented some new features! You will now be a able to setup a “Free Days” option for Anniversary based Memberships! This works like profile where a user can set up their credit card but the amount for the membership is not charged to their card. There are now more options for how you wish to prorate your new memberships! Here’s an example: Let’s say your membership year runs from January to December and a new member signs up in June. You can set a proration up for them so they only have to pay for a half year’s membership and will be up for renewal next January. Meaning that this new member now aligns with your membership year as opposed to paying a full year’s membership dues for only a 6 month membership. In many cases, organizations have proration's in place because renewals became too much to keep up with on a month to month basis. So instead of spending countless hours on renewals, these organizations set up their automated prorated billing so they can concentrate their efforts once a year. 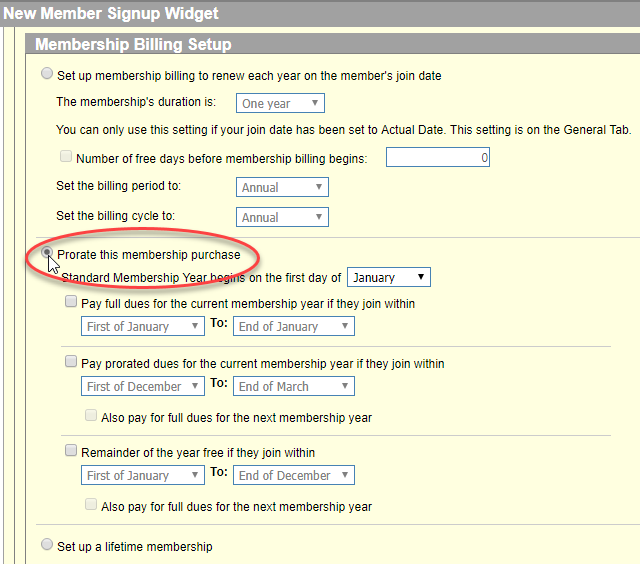 These setting give you full control over how you would like your members to be charged based on their signup date. The concept of these memberships is for the ability for the member to pay once and be a member for life. This is common for larger associations who prefer to charge a large upfront fee (tax deductible to the member) in exchange for membership for life. Another example is when some startup organizations offer a “founding lifetime” membership for their first 100 members or so. Don’t forget to check out last weeks Part 1 of the BIG New Member Update! Check out a previous Latest Buzz blog where we talk about New Member Renewals and how you can fully automate the process!